Writing a book (if you are serious about it) is a huge commitment. I have been getting up at four o’clock every morning to get in a couple of precious hours with the computer. A rich seam of inspiration all too often has to be abandoned when I break off at 6.30 to cycle into work, and by the time I get back home in the evening I’m too mentally drained by the day job to return to the manuscript. A couple of years ago I sought permission from my boss to reduce my working week from five days to four. I’ve had to tighten my belt financially but I’ve gained an extra day every week to spend on writing. Writing a book is also an act of faith. Unless you happen to be J.K. Rowling, Bill Bryson or John Grisham the dread that the countless lonely hours you spend shut away with the computer might ultimately count for nothing is the author’s lot. In ‘Why Don’t You Fly?’ (http://www.cycleuktochina.com/) I compared the procedure to starting out with a great, shapeless lump of clay and attempting to fashion something useful or beautiful (or both) out of it. It is a constant process of adding bits here, taking bits off there, transferring pieces, and moulding and reshaping the whole, but instead of clay my raw materials are words, sentences, paragraphs and blocks of prose. They have to be the right words, sentences, paragraphs and blocks of prose and they must be assembled in the right order. ‘Why Don’t You Fly?’ was nevertheless a comparatively straightforward book to write. It relates the story of a single journey with a beginning, a middle and an end. PREVIN: You’re playing the wrong notes. MORECAMBE: I think you’ll find I’m playing all the right notes, but not necessarily in the right order. 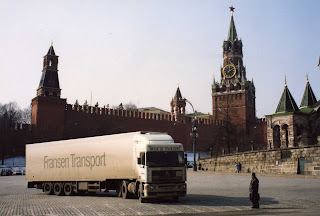 Intended to provide an examination of Marxism that is not only comprehensible but fun, Karl Marx and Careful Driving describes no less than three return journeys, all of which were made by truck f rom the United Kingdom to the territories of the former Soviet Union in 1993-4. 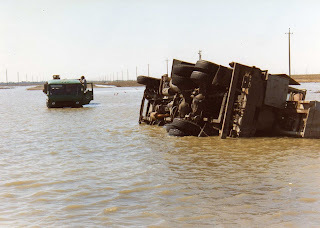 By charting the rise and fall of communism and the adventures of the author and his colleagues as they cover extraordinary distances in their immense vehicles over some of the most inhospitable terrain and climatic conditions imaginable, the book will show that ideas are more powerful than tanks and guns; that capitalism survived communism because the latter failed both to adapt to change and to recognise the passion and the capacity to dream latent in the human soul; that Marxism-Leninism failed to acknowledge that human beings are aspirational rather than egalitarian by nature; and that Marx’s radical theories (many of which remain relevant today) might have worked in a modified form but in the hands of zealots and opportunists who ruthlessly exploited and perverted his theories to retain power their social and economic consequences were disastrous. 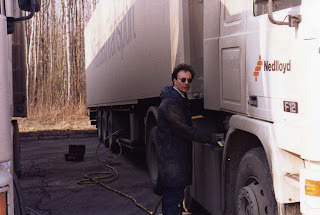 The humorous application of Marx’s ideas on alienation and freedom to late twentieth-century working life in international haulage will, I think, make the book unique. Each trip corresponds to a period in European history. The title of the first section of the book, ‘The Heat’, alludes not only to the blistering summer temperatures of Central Asia encountered during a first trip to Kazakhstan (made in July 1993) but also to the rise in political heat generated by friction between quarrelling European powers that culminated in the Russian Revolution, two World Wars and the Soviet Union’s transformation from inter-war isolation to a post-war colossus that defeated Nazi Germany. 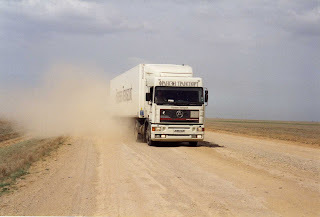 Karl Marx’s critique of nineteenth-century capitalism is compared and contrasted with late twentieth-century capitalism as demonstrated by the ups and downs of life as a long-distance truck driver. 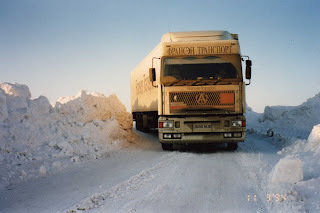 The second section, ‘The Freeze’, will parallel a winter expedition to Kazakhstan in December 1993 on roads covered in snow and ice with the Cold War stand-off between western democracy (in which consciousness was meant to dictate life) and Soviet despotism (in which life was intended to dictate consciousness). Marx’s vision of communist abundance and emancipation is juxtaposed with the post-war repression of Soviet and Eastern Europe populations by Stalin, Khrushchev and Brezhnev. Spring in Russia is a time of melting snow and ice and flooded roads. The third and final section, ‘The Thaw’, will describe a journey made to Moscow and the Baltic States in April 1994. It will also examine the political thaw instigated by Gorbachev’s reforms and the velvet revolutions that subsequently took place in Eastern Europe in 1989 before the collapse of the Soviet Union in 1991 and the end of the Cold War. 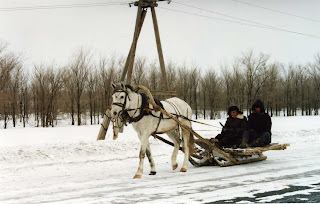 Snow and ice, the ineptitude of local drivers, armed robbery and mechanical failure were all dangers in these journeys to the former republics of the Soviet Union. Ultimately Karl Marx and Careful Driving is intended to be an examination of human nature itself. What is it to be human? And what is it to be inhuman? The book that perhaps comes closest to the concept I have in mind is Zen and the Art of Motorcycle Maintenance, in which Robert M. Pirsig uses a motorcycle journey across the United States to expound his philosophical theories. Sometimes I get a brief glimpse of what Karl Marx and Careful Driving could be like if all the pieces of the jigsaw fall into place, but such moments of euphoria are fleeting. There remains a yawning gulf between the complex vision of a book blending travelogue, history and philosophy and the current messy and fragmentary state of the manuscript. Contrapuntal layers of narrative have to be deployed to uphold or to refute Karl Marx’s claims about the human condition and freedom. I alternate between belief that it will all come together and crippling doubt that I possess either the intellectual capacity or the writing skills to make a fantastic idea work; Lenin and his successors demonstrated all too clearly what a dreadful mess can be made of a fantastic idea, and I can only hope that my efforts to translate concept into reality will be more successful than theirs. Assembling the many pieces of the puzzle and finding a way to fit them all together is nevertheless a challenge that I relish, for this is surely what writing is all about. I don’t like to set myself time limits; it may well be another two years before I feel ready to start sending synopses and sample chapters out to literary agents and publishers. In the meantime I’ll keep you informed of progress on Karl Marx and Careful Driving by providing periodic updates on this blog, a process that will continue when the manuscript is completed to my satisfaction and I approach agents and / or publishers. If you’d like to be advised when Karl Marx and Careful Driving becomes avalable, please leave your contact details by emailing me on the contact the author section of http://www.cycleuktochina.com/.